The high light of this Bali Combination Tours is Exploring The Green Plantation and The Jungle by ATV , which will give the real Bali Adventure experience, therefore this Tour Combination is perfect For those who like the adventurous tourist and want to test your adrenaline ride ATVs try this one. ATV Riding is an adventurous tourist with a special motorbike with 4 wheel. This ATV bike made specifically so easy to drive by anyone, though has never been on a motorcycle though, during the ATV Adventure you will pass the Agriculture Area, and Local Villager House. 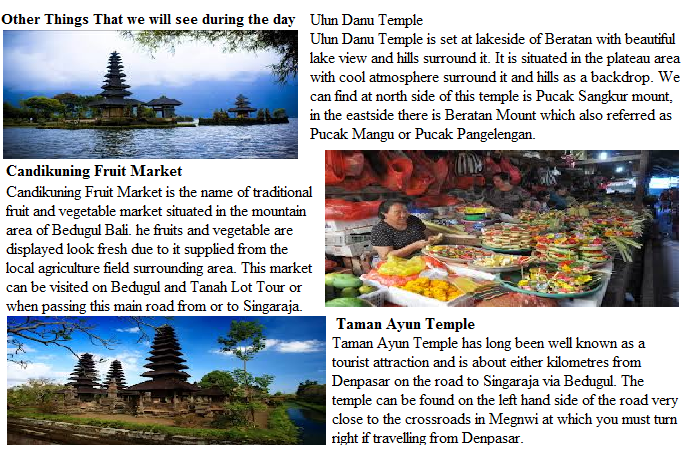 Beside that in this Bali Activities Tour Package firstly we will show you the amazing Temple look floating on the Sacred Lake of Brantan, the name of the Temple is Ulun Danu Temple, After the adventure we also will take you to the Most Beautiful rice field in Bali called Jatiluih, which it’s will blow your mine. 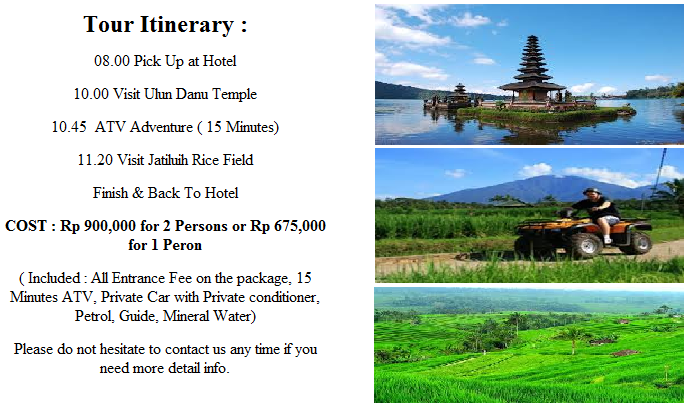 And should you want to having lunch , Jatiluih is the best venue, because Mostly Restaurant in Jatiluih is facing to the Beautiful of Bali Rice Terrace. 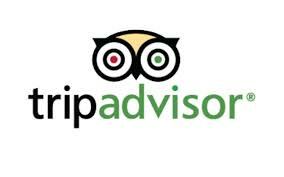 ATV ADVENTURE, LET INCREASE YOUR ADRENALIN, Bali local tour guide also able provide another place for Atv Adventure, best and closer area for Atv mostly located in Ubud Area, how to ride and for your safety let check it below. ATV ride through the rice fields and through various exciting challenges in Bali?come Follow Travel ATV riding in atv adventure bali through Bali local tour guide,before the activities you will be given the completeness of the form of knee and shin protectors, elbow protectors, helmets and masksonce ready you can try your first ATV .riding ATV had never been before? calm, you will be given basic ways how to ride an ATV.It’s quite easy ATV riding, there is provided two types namely ATV Single and Tandem 250 CC,there are only a few important controls for example the brake and gas through a kind of starter button.to turn left or right, turn the handlebar is powered in the desired direction.In this session good use of to know your vehicle.If all ok will be great, you’ll adventure is just beginning.from Starting point we will go to the fields, to pass through the settlement and went down the main street.We begin to trace the path of the small size of the ATV, the adrenaline began to be tested.focus on vehicles so important, should not be careless at all.Oh yes, no tips, one for the game ATV is: never once lower feet to land (DANGEROUS), so place your feet remain in position.